Kim Mahood's body of work traces her evolving relationship to the Tanami region, and increased involvement in projects recording Aboriginal knowledge systems of place. 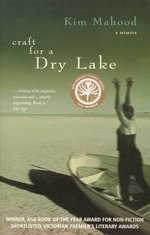 Mahood's memoir, Craft for a Dry Lake, is impelled by her father's death, prompting her to examine the legacy of their close relationship. Returning to her childhood home in the Tanami desert is integral to her quest. But this is an ambivalent homecoming.